Pennsylvania is closer than ever to finally legalizing medical marijuana. Two weeks ago, the Pennsylvania House of Representatives passed legislation to legalize medical marijuana. Now, we are waiting for the Senate — who is back in session April 4 — to vote on the bill and send it to Governor Wolf’s desk. The Senate has already passed legislation implementing medical marijuana twice. Once the bill hits Governor Wolf’s desk, he will sign it, finally giving important medical relief to patients and families across the commonwealth. Governor Wolf meets with medical marijuana advocates in the Capitol. Many have fought for years to get their suffering family members legal cannabis treatment. Governor Wolf is urging quick action by the Senate when they are back in session so he can sign the bill to legalize medical marijuana, bringing doctor-recommended treatment to those who need it most. 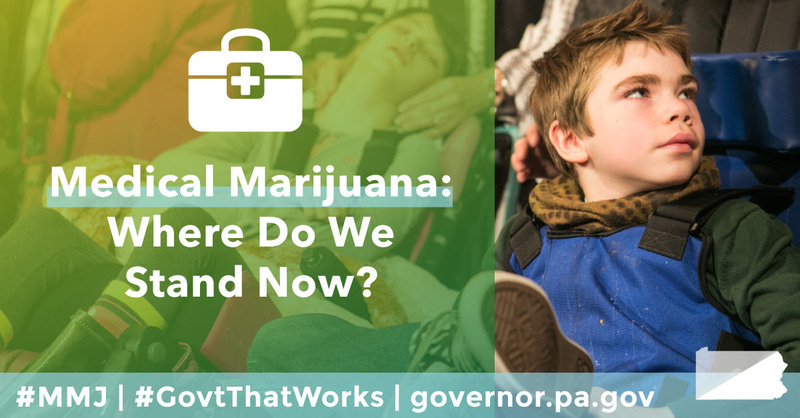 Governor Wolf has long supported the legalization of medical marijuana. He has met with patients and families, held roundtables, and urged action on this legislation since taking office.